Bango today announce that they have signed a Global Framework Agreement. 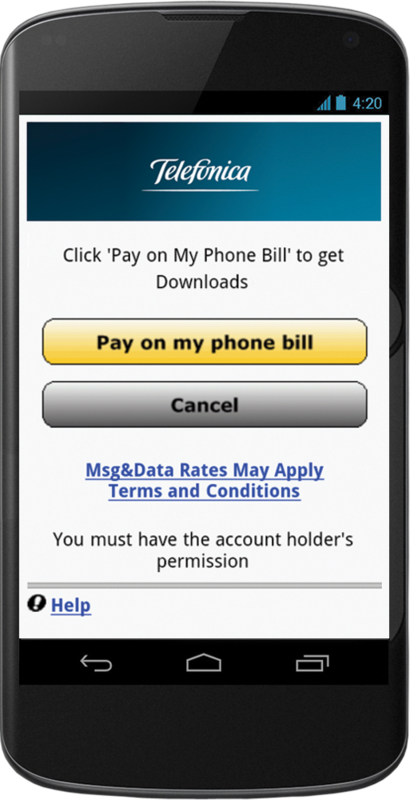 The two companies will partner globally to create an enhanced direct-to-bill payment experience for mobile app stores. The partnership will combine Bango’s frictionless payment experience with Telefónica’s BlueVia Payment APIs, connecting over 314 million chargeable customers worldwide to the Bango Payments Platform. The ability to pay for digital goods and services via a mobile phone bill or prepay credit is a key way for content owners and developers to fully monetize their products. This is especially the case in developing markets, such as Latin America, where penetration of bank accounts and credit cards is very low. Trials of direct to bill in Telefónica operating businesses have proven its ability to drive sales. Bango CEO Ray Anderson commented that “Telefonica and Bango share a strategic vision: to widen access to paid content by standardizing and simplifying operator-billed mobile payments. BlueVia is a valuable and bold initiative by Telefonica to establish a unified set of billing APIs. We will standardize on BlueVia to connect with Telefónica’s 314 million subscribers around the world and look forward to welcoming other operators who join this initiative, as Telenor has done”. This entry was posted in Announcements, Press releases 2013 and tagged bango payment, operator billing, Telefonica. Bookmark the permalink. Reblogged this on Contactless Intelligence.